Skin color of human is same almost all over the body after birth. With the phase of time the skin color is changing. Especially we are noticing the changes of those places where adequate light, air, water and other natural elements are not reaching like genital areas and armpits. We always blamed the climate for this dark spot. It is a matter of discomfort for some people for rapid increasing dark spot. But almost everyone keeping it secret as this is a sensitive and shameful issue. They are not only feeling shy but also feeling uncomfortable to share this with doctors. That is why the problem remains. Basically the noxious chemicals which are released by sweating from our body not cleaned immediately. Alongside the dark spots are getting darker even acute by using chemical product like hair remover, lotion, cream, oil etc. And the odor is also a part of that problem. For that reason some ladies cannot wear their favorite sleeveless dresses. To solve the problem this is the first time in Bangladesh a South Korean product named “Underarm whitener” is launched. 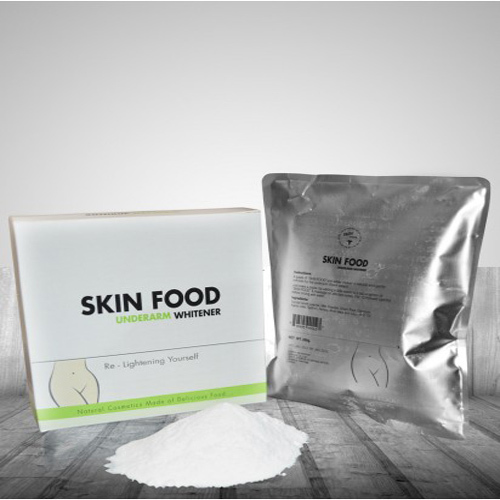 After analyzing the labeled ingredient we came to know that the product is made by combination of various rich food elements which can considered 100 percent natural cosmetic product. Only 14 days, yes, only 14 days you can regain the colour of damaged skin from affected areas of your body. Which also reduce odor from these areas. It also fully kills the germs from the affected areas. A paest of SKINFOOD and water makes a natural and gentle exfoleate for the underarm Black areas. Just make a paste by adding a little water to a table spoon of SKINFOOD ^and massage on affected areas. For 10 miniuties gently before rinsing with water. স্কিন হোয়াইটেনার শরীরের স্পর্শকাতর ত্বকের কালো ছোপ দূর করুন সহজেই !